Nadiya Savchenko, former first lieutenant of the Ukrainian Army and now a Member of Parliament of Ukraine, and the beloved heroine of Ukrainians across the planet, today marks her 21st day on hunger strike in a Russian prison. She has not been allowed to see her lawyer until January 12. The details of her innocence have been written about many times. Savchenko was one of Ukraine’s first women to train as an air-force pilot, and to date the country’s only female aviator of the Sukhoi Su-24 bomber, and of the Mil Mi-24 helicopter. RIGHT NOW is the time for every single one of us – that means all of you dear readers – to raise one hell of a big stink about this! We are trying to create a HUGE campaign of it and hope every media person who reads this, every bureaucrat and politician that reads us, and everyone else who reads us, will post to their twitters, Facebook pages, other social media, send to their politicians and newspapers and online media locally and nationally in whatever city and country you live in to put this into mainstream public awareness and not allow the Kremlin to sweep what they are doing to her under the carpet quietly. Please gear up for this now and be prepared. Please start earlier if you can too. Please do something, don’t read this and do nothing. If you want to send us anything to post we will review it for reposts. This is URGENT. Thank you for your participation. This entry was posted in #Free Savchenko, English, Petitions, Pictures, Social Media, War in Donbas and tagged #FreeSavchenko, #glasnostgone, #KremlinLies, #Nadiya Savchenko, #RussiaInvadedUkraine, #UkraineUnderAttack, Ukraine. Bookmark the permalink. I am totally shocked by the “civilised” world leaders. 50 states of USA, 28 countries of EU and see?? Do you see it? They can not stop 1 person. 1 their best friend for 25 years. Is it not strange? Probably they (the West) enjoy the ride. Why do they want to lead people when they are hopeless, useless? Do you enjoy such a lead, these politicians-gangsters? Надежда – настоящая Героиня Украины! Most important is to stop hunger strike of Nadiya. It will ruin her health and very likely she is near death. This death would be for nothing, it does not change something because Putin does not care about an individuals life. And the western politics are not interested. They currently enjoy to spend their christmas holydays far away from any thoughts about war and ukraine. So it is illusion that this hunger strike will have any political effect. Save Nadiys life we need her later for new ukraine. Andreas I am not totally with you on this. Nadiya is standing on her own two feet and doing the only thing that is left to her in hopefully attaining her release. Hunger strike is a powerful weapon, I would refer to you the hunger strikes in the Maze prison, Northern Ireland in the 1980`s. Martyrism is the key, she may not want to be a martyr and wants to live of that I am sure whereas putin may appear not to care about others but what he does not want is a martyr to strengthen the resolve of the Ukraine forces on the ground and the people as a whole. She will not be the last to take this road as there is always be someone who will take her place and continue the fight. As for the West I agree with you, Ukraine has become another political pawn at the expense of people, however I am sure that the powers that be know exactly what is going on and will let the situation play itself out and use it for their own means when the opportunity arises.
. Nadiya is still fighting in the only way she can, respect her for it and support her. In the center of Berlin / Germany in front of the Russian Embassy there is a weekly picket or protest. We will keep on until Nadiya Savchenko is back in Ukraine and healthy. On January 6 isn’t there Orthodox Christmas? Please, give her, all Russians, where ever they are, and all Ukrainians a peaceful Sochelnik at their family at their own home! Goetz, thank you! Send us some photos of your protest!!! Yes Jan 6 is Christmas Eve and 7th Christmas Day. Хай Бог благословить Надію, і перш за все збереже її життя, і подарує їй здоров’я і волю. Whoever can do anything, please help save this innocent person of so noble character. The world is watching! Release her now! Пане ліліпутін, не принижуйте свою країну незаконно утримуючи безневинну жінку. Лише мерзенні нікчеми та імпотенти викрадають і утримують дівчат всупереч їх волі. Звільніть Надю Савченко! Mr. liliputin do not humiliate your country while throwing illegally an innocent woman into jail. Only vile villains and impotent men kidnap women against their will. 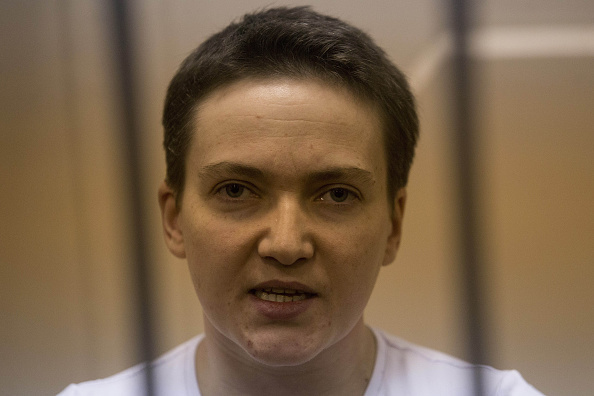 Release Nadya Savchenko! Свободу гражданке Украины Надежде Савченко! 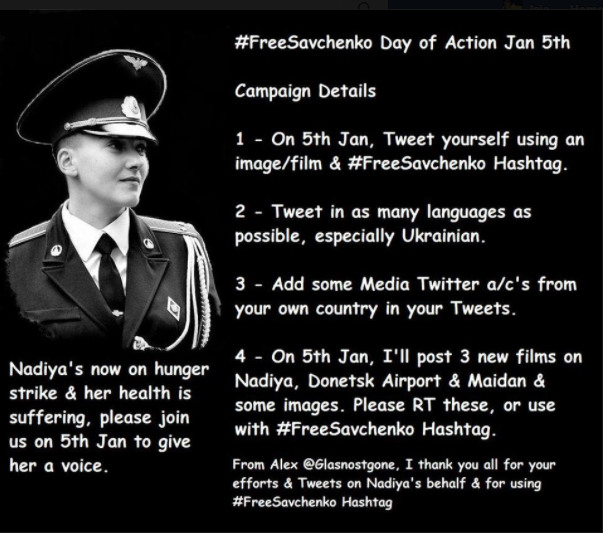 Nadiya is innocent and needs to be released as were prisoners earlier between Ukraine and Russia. She needs to be home for Ukrainian Christmas – Mr. Putin, will you be celebrating Syvat Vechir – show us that you are some kind of a Christian ? Освободите девушку ! Так не поступает Страна ! “Ибо воистину сгинуть всем, кто пролил невинную кровь и быть проклятым всем их, бо не дано быть с Богом без любви в сердце, а есть проклятие, в ненависте быть”. В святой вечер мы с тобой, Надя!!! Негайно звільнити українську Надію Cавченко Те, що робить з нашою Героїнею Путін обов’язково повернеться бумерангом до нього. Не можна так знущатися над невинними! Нехай Бог дає їй сили, здоров’я та витримку! Не будьте байдужі, врятуйте Надію від смерті, поверніть її в Україну! Слава Героям України!